This Sage Creek beauty is tres magnifique! With all of its 1703 square feet of living, it has everything you are looking for in your next home. And with its 3 bedrooms, and 2 1/2 bathrooms, the family will love it. Minutes from a new school too! Let’s start with that all important first impression … is that a welcoming front porch? Yes it is! And with its floor plan, it flows from one room to the next seamlessly. A large front entry way featuring a built-in bench beckons you inside, and immediately introduces you to the great room. Expansive and bright due in no small part to three large windows that oversee the rear yard. It opens to the eating area that showcases its patio doors that will deposit you to your BBQ station and railed landscaped deck. Just in time for summer! For those indoor meals, a wonderful kitchen featuring gorgeous maple cabinetry awaits! Alongside plenty of counter top space and a breakfast bar. A wonderful spot to begin your day. A main floor laundering room, that accesses the double attached garage adds to the convenience factor. Up the stairway, you will find the bedrooms, including a huge master suite with a 3 piece ensuite, and a walk-in clothing closet. And room for a desk between the secondary bedrooms that the kids will find more than ample in space, and feature double closets and large bright windows. As for the fully developed lower living area, the rec room will have you reaching for the remote in no time. The barn wood floating shelves are nothing short of exquisite! Plus an electric fireplace to warm things up for early morning coffee or date nights with a movie. Such a comfortable space, and it continues to impress with a separate games area! Need another bathroom? It’s already been roughed in and awaits your finishing touches. No shortage of storage space here either. Stepping outside the aforementioned deck is your personal solitude, and your rear yard is fully fenced for privacy. As well, a sandbox, storage shed, and lots of room for your plants or vegetables to grow. 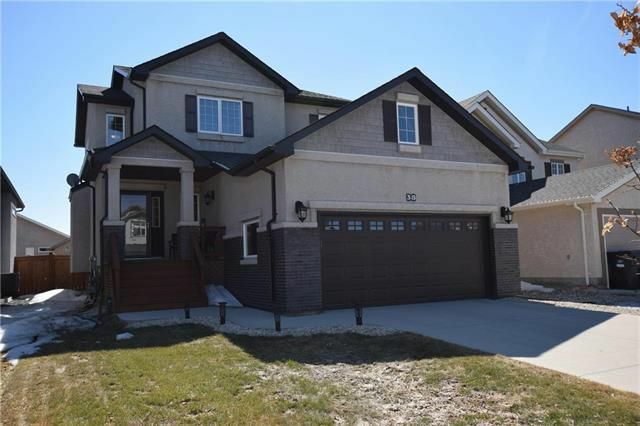 Sage Creek is a desirable neighbourhood, and the main road leading in has all the conveniences you need from grocery shopping, a gas station, veterinary clinic, banking, and a Tim Hortons. Plus restaurants, and a newly opened fitness facility.